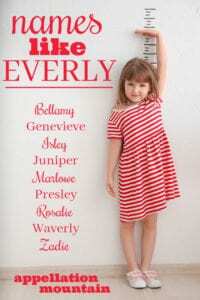 Looking for names like Everly? You’re not alone! Everly has gone from sometimes-heard surname to one of the hottest girl names of the moment. It combines the vintage of appeal of favorites like Ava, Evelyn, and Eva with a more modern, unisex style. 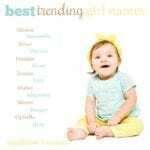 Everly fits with our long tradition of three-syllable, ends-in-y names for girls – think everything from Dorothy to Emily to Kimberly to Delaney – but it’s fresh and new for parents today. And we’re wild about the letter v, so that’s a big plus, too. One more reason to love Everly? It’s a rock star surname, thanks to Hall of Famers The Everly Brothers. The duo scored their first hit in the 1950s, and recorded dozens of familiar songs over the next decade. If Lennon and Hendrix are big, then no surprise this name is on the rise, too. The name was virtually unknown even fifteen years ago. It debuted in the US Top 1000 in 2012, and reached the Top 100 last year. That is the textbook definition of a meteoric rise. So now that everyone, from Channing Tatum to that family down the street, has discovered Everly, what’s next? 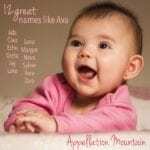 Try these ten possibilities are names like Everly. They claim the same mix of modern sound, with traditional roots, but none of them are nearly as popular – yet! Everly is to Evelyn as Bellamy is to Isabelle – a surname name with distinct roots, but a sound similar to current c. Bellamy also offers an appealing meaning: fine friend, from the French phrase bel ami. A handful of high profile uses have given Bellamy more exposure. The Novogratz design family has seven beautifully named children, including twin daughters Tallulah and Bellamy. As they’ve done television specials and magazine spreads, parents have taken notice. More recently, sci fi television drama The 100 gave the name to a male lead. The name teeters just outside the current Top 1000. In fact, it was on last year’s Trendwatch of names I expect to break into the rankings any minute now. Still, for now, it’s way under-the-radar compared to fast-rising Everly. If you love the sharp ‘v’ of Everly, Genevieve might make a good substitute. It’s rock steady – a traditional French name that’s gained in use in the US, but isn’t skyrocketing. And yet it shares Everly’s appealing, three-syllable rhythm. There’s something lively and upbeat about Genevieve. 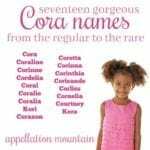 In France, it’s a mid-century name, relatively uncommon for girls born today. But in the US? Genevieve was a Top 100 favorite in the 1910s, but has only recently started climbing back into the spotlight. I’ve called it a Sweet Spot name, stylish, but not too trendy. It might make a great compromise between, say, Charlotte and Everly, too. Read more about Genevieve here. The Everly Brothers were hit-makers back in the day; so were the Isley Brothers. But while we’re all about Everly, Isley is barely a blip, given to fewer than 100 girls last year. And yet, if Top 100 picks like Evelyn and Eva pulled Everly up the charts, couldn’t Isla do the same to Isley? Lady Antebellum’s Hillary Scott named her firstborn daughter Eisele Kaye, pronounced just like Isley, from a family surname, in 2013. So far, no spelling has caught on. Another reason to love it? Isley may come from the Germanic Isenhart, meaning iron strong, or an Old English name meaning “hazel wood.” Another spelling that might appeal? Eisley. I’ve yet to write about Isley, but check back and I’ll update when I do. Juniper feels like a successor to 70s mega-hit Jennifer, but I like it as a substitute for Everly. It’s a little more modern than Genevieve, but every bit as cheerful. Like Everly’s connection to Eve, Juniper seems more conventionally feminine because it starts with June. It’s been on the rise for the last few years, but it’s not nearly as dramatic a spike as Everly. I can imagine it as a sister for Everly, and it works equally well as a substitute. Read more about Juniper here. A surname name with a fresh, modern sound? That describes Everly – and Marlowe, too. After a handful of high profile celebrity birth announcements, Marlowe entered the most recent US Top 1000 list. It fits with Harlow and Monroe. Christopher Marlowe makes it literary. Thanks to midcentury charmer Marlo – either a Mary-Louise mash-up, or maybe a Margaret nickname, as in Marlo Thomas – it feels just feminine enough. Many of the rock star surnames go to the boys, but Presley – as in Elvis – is reserved for the girls. Credit Paisley, maybe, or so many other ends-with-ley names over the years. It’s a pretty common surname, likely meaning “priest’s wood” – or wood by the church, which seems like an appealing image, too. I think the way the ‘s’ of Pres almost sounds like a ‘z’ adds some interest to this name, and makes it a logical alternative to Everly. I’ve yet to write about Presley, but check back and I’ll update when I do. Everly leans modern; Rosalie feels vintage. But they’re both three syllable, ends-with-y names for girls, with the same appealing rhythm. If you love Everly, but worry it might feel dated or trendy, then opting for a name more like Rosalie might satisfy. The sound is every bit as upbeat, and very current. But the connection to the enduring Rose means that it reads a little more traditional. Read more about Rosalie here. Waverly comes close to Everly – the ‘v’ middle, the -ly ending. But Waverly makes us think almost immediately of the natural world, of waves crashing on the beach. Turns out Waverly probably refers to something else – the quaking aspen. But it’s still a nature name. Fun fact: at the end of The Princess Bride, Buttercup and Westley welcome a daughter named Waverly. Read more about Waverly here. Zippy Z names are having a moment, from Zoe and Zoey to Zuri and Zara and Zelda. British author Zadie Smith boosted the name with her 2005 bestseller On Beauty. The rise in Z names and Sadie helped, too. While it’s long been used in small numbers, today Zadie sits just outside the current Top 1000. Because of that big Z and bright ‘a’ sound, I can imagine the same parents who love unforgettable Everly embracing Zadie, too. I’ve yet to write about Zadie, but check back and I’ll update when I do. What do you think? 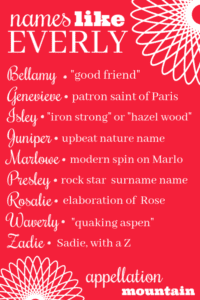 Would you consider any of these names instead of Everly? What would you suggest in addition to these names? I love the name Genevieve for a middle name. Any suggestions for a first name to go with it? Reid, Gibson and Sadie Marguerite are the siblings.